Leta Antoniou at Parsifal Yachting is offering the 49.2m motor yacht Zaliv III for charter. Built to ABS class in 2011 by Mondo Marine, Zaliv III recently completed a very successful charter season this summer. The interior layout accommodates 12 guests. Two master suites of equal size are available, a full beam one on the main deck, and one on the bridge deck with direct access to the aft deck. The eight further guests are accommodated in two double and two twin cabins on the lower deck. Features include a Jacuzzi on the upper deck, WiFi throughout and zero-speed stabilisers while her range of water toys include a tender, jet skis, water skis and fishing tackle. 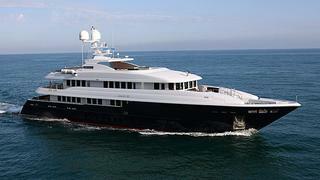 Zaliv III was a finalist in the 2012 World Superyacht Awards. Based in the Eastern Mediterranean, Zaliv III is available at weekly rates of €240,000 in high season and €195,000 in low season.